The lovely assistant Abe with our stand-in for the Grey Cup. It was mid October, and there we were trying to make our shot look like a chilly scene from the Grey Cup game day - not an easy endeavour given the shoot day temperature was above 10°C. 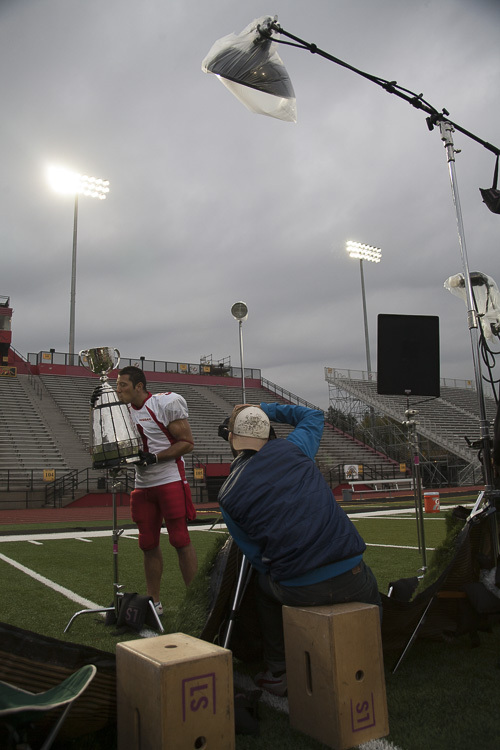 To make matters slightly more interesting, our hero prop for the shot was the one and only Grey Cup – not an item to be trifled with. Thankfully we had a few tricks up our sleeve get the shot. This campaign for Nissan came to us from Guilherme Bermejo and Nicholas Doerr over at TBWA Toronto. 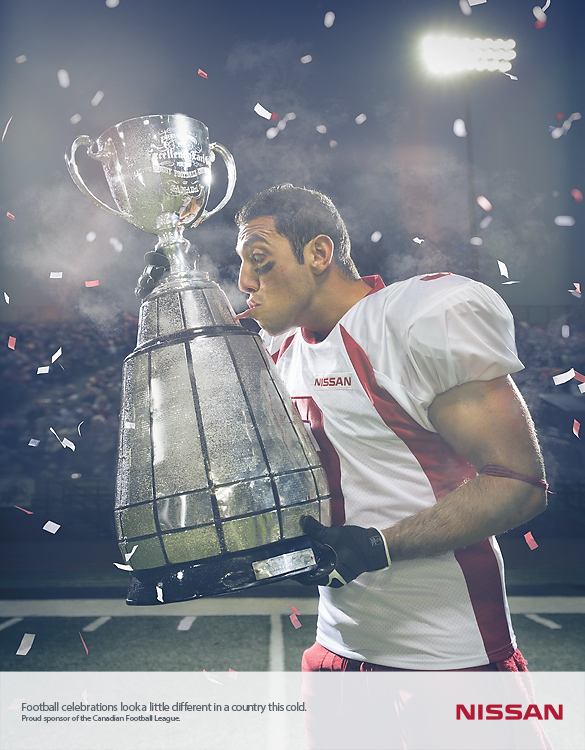 The main shot shows a football player kissing the Grey Cup after a chilly winning game, while his lips get stuck to the frozen metal trophy. The second shot shows players celebrating and pouring Gatorade on their coach, only what comes out of the cooler is a solid block of ice, knocking the coach unconscious. We knew it would be the fine details that would really pull this campaign together. 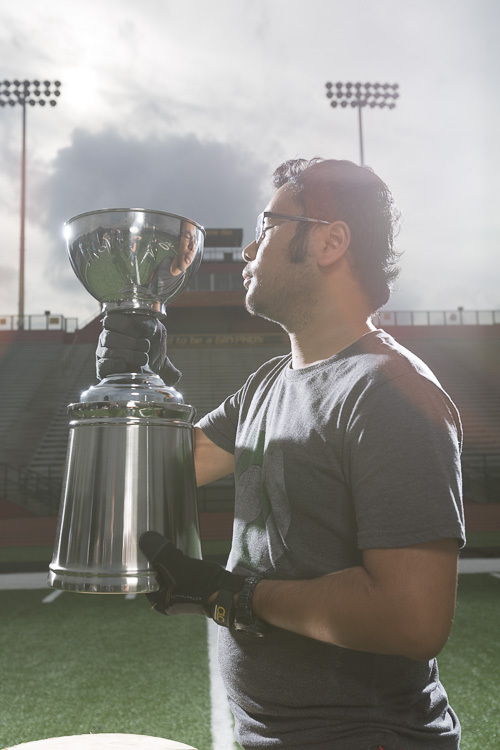 Beginning with the Grey Cup itself, we needed to have our talent’s lips stick to the cup, and we wanted the trophy to look frosty. Two things easily solved with a little double sided tape for the lips and some polymer special effects ice crystals for the frost. Without being sure if we could apply either of these to the actual Grey Cup, we had a backup plan to apply them to a stand-in cup we built ourselves, then transfer them to the real cup in post. In the end, we were permitted to use the actual trophy to shoot both elements, and sadly the stand-in cup never saw the limelight. To bring us further into a cold world, we layered in some steam for the breath and the sweaty players. We then took a layer of snow and applied it to the field in post. Our final cold element appearing in the second shot was the block of ice that came from the cooler, which we had custom flash frozen out of Gatorade. Finally, we needed to fill the grandstands with a crowd. We opted to shoot this at a CFL game in the same stadium the night before. This gave us a seamless blend with our hero shot, and kept our budget in check by eliminating the need for background talent to fill the seats. Thanks to Gui, Nick, Rodger Eyre and the team at TBWA for such a great creative project. And thanks to Natalia Zurawska and Kirsten Reader for making the guys looks like sweaty athletes, and to the crew: Dwain Barrick, Abe Roberto, Ian Patterson, Sam Grant, and Spencer Robertson for another long day. The Cup caretaker carefully places the trophy onto the rig. The set on location at Varsity Stadium in Guelph.